Laughter comes from the kookaburra at dawn, ‘but when the sky with stars is touched, kookaburra’s laugh is hushed’. It is then the lullaby of nature begins and the Australian forest animals snuggle to sleep. 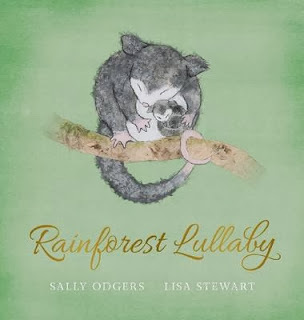 Ringtail Possum is curled in a hollow; Tree Frogs cling, ‘green-on-green’ as butterflies pass. Devil pups ‘snuggle in a furry heap’ and Cassowary and chicks in ‘feathered stripes’ cuddle together. The Water Dragon dreams ‘of an ancient time’, while Boobooks roost at the end of day. Echidna, full of yummy ants ignores the ‘steamy hours’. And the new born baby sleeps. But the Sugar glider takes flight at night and finds peace when all the rest are waking. In delightful rhyming verse, this exotic production with illustrations in collage against variegated earthy browns and greens is a hymn. It’s a salutation to the moon and quiet of the earth; a lullaby as gentle and fragile as life that speaks of beauty, calm and comfort.